December 31, 2009  A federal judge dismissed all charges against five Blackwater Worldwide security guards charged in the deadly shooting of civilians in Baghdad in 2007. The judge said the Justice Department's explanations have been contradictory, unbelievable and not credible. Del Quentin Wilber, federal courts reporter for The Washington Post, offers his insight. December 31, 2009  Saudi Arabia's rehabilitation program for former detainees at Guantanamo Bay includes religious dialogue and relies heavily on families of the former detainees. Christopher Boucek, an associate in the Middle East Program at the Carnegie Endowment for International Peace, says that to date, the program has had a success rate of about 80 percent. December 31, 2009  Four members of al-Qaida in the Arabian Peninsula, the group that claimed responsibility for the attempted Christmas Day airliner attack, were previously detainees at the U.S. prison camp at Guantanamo Bay, Cuba. Although most Guantanamo detainees have returned to their old lives, several have rejoined the battlefield. December 31, 2009  As the world focuses on the conflict between the Israelis and the Palestinians, a divide is growing within Israel. Religious and secular Jews are increasingly at odds, and nowhere is the split more obvious than in Israel's two main cities, Tel Aviv and Jerusalem. December 30, 2009  Yemen's permanent representative to the United Nations says his country needs more money to get rid of al-Qaida. But Abdullah al-Saidi says he does not want the U.S. to go in and do the job itself. The comments follow attention on Yemen after the failed Christmas Day plot to blow up a Detroit-bound airliner. December 30, 2009  Anwar al-Awlaki is believed to be targeting young men seeking guidance. He has been linked to the alleged Fort Hood shooter, among others. December 30, 2009  Host Michel Martin talks to Iranian journalist and political cartoonist Nikahang Kowsar. Kowsar, who lives in exile in Canada, recently launched a citizen journalism Web site which has become a repository for first hand accounts of life in Iran. Kowsar discusses his recent journalistic venture and the current political tensions arising in his home country. December 30, 2009  This year began with some hope of change in the long confrontation between Iran and the West, but it's ending with new allegations about Iran's nuclear program. The Associated Press obtained a document saying Iran is trying to buy 1,350 tons of uranium ore from Kazakhstan. Associated Press reporter George Jahn talks to Steve Inskeep about the document. December 30, 2009  The suspect in the attempted bombing of an airliner on Christmas Day, Umar Farouk Abdulmutallab, spent the past few months in Yemen, and a branch of al-Qaida based in Yemen has claimed responsibility for the attack. That's raising questions about the Obama administration's complicated relationship with Yemen and its efforts to counter a growing threat. December 29, 2009  The attempted bombing of a Northwest Airlines flight on Christmas Day has thrown a spotlight on the nation of Yemen, after an al-Qaida group that's based there claimed responsibility for the foiled attack. But the United States had already been ramping up its operations in Yemen to counter the al-Qaida threat there. December 29, 2009  Demonstrations in Iran have been centered in big cities, and so far haven't gained traction in the traditionally rebellious Kurdish province in the northwest of the country. But while Kurdish Iranians don't appear quite ready to join the opposition movement, they do seem to be helping dissidents from Tehran escape to Iraq on their way to Europe. December 29, 2009  President Obama started the year promising a big push to promote Arab-Israeli peace, but his administration ends the year, as one U.S. official recently put it, in a cul-de-sac. The U.S. has been unable to get Israeli-Palestinian talks started, and many Arab states have been frustrated. December 29, 2009  The Iranian government has responded to the violent street clashes by making hundreds of arrests. Those in detention include former Foreign Minister Ebrahim Yazdi. His son — Youseph Yazdi, a faculty member at Johns Hopkins University — tells Steve Inskeep that it is a positive sign that the Iranian people are expressing their anger and standing up for their rights. December 29, 2009  The suspect taken into custody for detonating explosives on an airliner near Detroit apparently told authorities he had gotten the explosive material from a bomb expert in Yemen. Richard Fontaine of the Center for a New American Security talks to Linda Wertheimer about deteriorating security in Yemen, and U.S. efforts to fight terrorism there. The center develops national security and defense policies that protect U.S. interests. December 29, 2009  The West Bank village of Bilin has become an international symbol of Palestinian resistance to Israeli occupation. For the past five years, Palestinian activists and their international supporters have gathered there every Friday. Palestinians say the protests are an example of non-violent resistance, a model they are trying to expand. 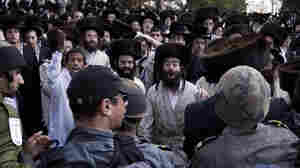 Israel calls them riots and police have been arresting the movement's leaders.